An E-3 is a visa for professionals in a particular specialty from Australia and is a US working visa intended for Australian citizens. In 2005, the United States and Australia signed the Australia Free Trade Agreement – USA (AUSFTA). As a result, they have created a special category which can be obtained only by highly skilled Australian citizens. Each year, only 10,500 E3 are issued to the United States. They are reserved for people who are specialists in special professions. Higher education qualifications such as bachelor’s, master’s or doctoral degrees. For people who have a lot of specialized knowledge. This means that only people with certain work experience and educational qualifications can receive an E-3. Work experience can replace educational qualifications if you have worked for more than 10 years in this profession. In addition, if a profession or specialty requires licensing, the applicant must also have the necessary authority. The US government does not indicate which professions qualify as specialties, but examples of such jobs include: business managers, engineers, mathematicians, computer scientists, medical practitioners, political scientists, and arts-related professions. 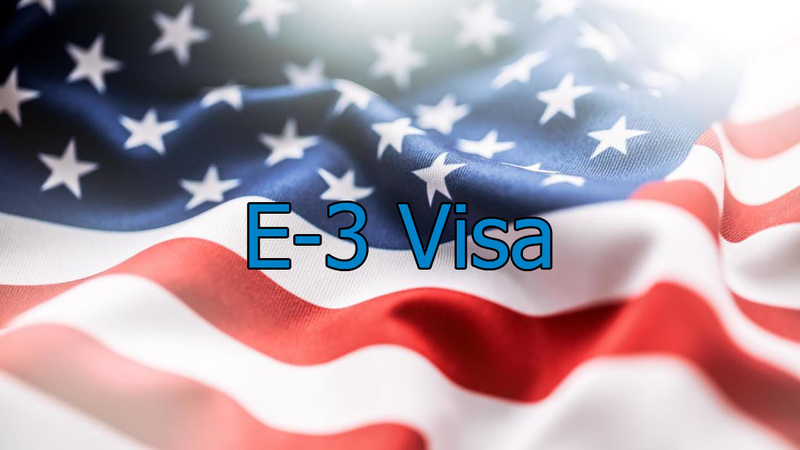 E-3 applicants must meet certain criteria and requirements in order to be eligible for a visa. The applicant must be an Australian citizen. Those who have a permanent residence in Australia are not eligible for an E-3 visa and cannot apply. The applicant must have a job offer in the USA. The job offer should be held in the specialty. The applicant must have qualifications in the field of education and professional qualifications in order to be a special worker. The applicant must have the necessary licenses for the occupation, if applicable. If you meet these requirements, you have the right to apply for a E-3. The visa application will be processed and you will receive an answer. If you get a visa, it does not necessarily guarantee your entry to the United States. This is at the discretion of immigration officials at any point of arrival in the United States. If they deem it necessary not to allow you to enter the country, you will return to Australia. How to apply for an E-3? Applying for an E-3 requires you and your US employer to go through several stages. The first condition is that you must find a job in the United States. You can apply from Australia and be interviewed on Skype until you find a position that you think is appropriate. When you receive a job offer and accept it, then you can begin the process of applying for an E-3. How long is an E-3 valid? When the Department of Labor issues an LCA to your employer, there is a specific term for it. The validity of it will be in accordance with the validity of the LCA. If the LCA is valid for 6 months, your visa will be valid for 6 months. Initially, an E-3 cannot be valid for more than 24 months or 2 years. After 2 years, you can apply for an E-3 extension as long as you maintain your eligibility. Your employer must receive an LCA with a new validity date and I-129 form. In addition, you must complete Form I-539, an application for renewing or changing status. You can extend the validity of your E-3 indefinitely, as long as you maintain your intention to return to Australia. In addition, you can change employers if you find a job that suits you. Your new employer must file and get a new and approved LCA. If you find an employer who wants to sponsor and file a job application, and pay additional fees, you can switch to H-1B visa status. H-1B status is limited to a maximum of 6 years, although an E-3 may be extended indefinitely. Can I apply for a Green Card with an E-3? When you apply for an E-3 and when you renew it, you must prove your intention to return to Australia. That’s why getting a green card is a daunting task. E-3 is not meant for multiple intentions, so it does not allow permanent residence. However, there are ways to get a Green Card. The easiest way is to change the status to a dual-purpose visa. Dual purpose visas are category H visas, such as an H-1B. When you get this visa, you can apply for the Green Card. Another way is if you have a family in the United States, you can apply for family reunification. Can I bring my dependents with an E-3 visa? When you travel to the United States with an E-3, you are allowed to bring your dependents with you. Dependents include your spouse and unmarried children under the age of 21 years. They can apply for their E-3D visa at the same time or after you. To get a visa, they need to prove that there is a relationship. For children, you must submit their birth certificate, while your spouse requires a marriage certificate. Spouses can start work by obtaining a work permit document. They can obtain a document by completing a form I-765, work permit. After it is processed and approved, your spouse can work in any industry and full time or part time. When you, as the principal owner of an E-3 visa, receive a visa extension, your dependents must also follow the same procedures to apply for a visa extension. In addition, if you receive a Green Card, your dependents are eligible to receive it. Attorney Claudine at Gasana Law Firm provides a variety of legal services including E-3 Work Visa for Australians. Contact Immigration Attorney Houston today!